Two men have been jailed for life at the Old Bailey for the homophobic murder of gay barman Jody Dobrowski. 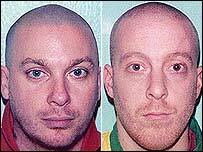 Unemployed Thomas Pickford, 26, and decorator Scott Walker, 33, admitted the killing at an earlier hearing. 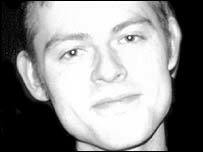 Mr Dobrowski was walking across Clapham Common, south London, when he was beaten to death on 14 October 2005. Prosecutors said Pickford and Walker had a "pre-meditated plan to attack a gay man". They were told they would serve a minimum of 28 years in prison. Judge Brian Barker said the pair had only one intention when they went to the common - "homophobic thuggery". "It was Jody's tragic misfortune to cross your path. You subjected him to mindless abuse and showed him no mercy. "In those few seconds you took from him the most precious possessions - his life and future." Mr Dobrowski, an assistant manager at Bar Risa Jongleurs, in Camden, north London, was on his way home from a friend's house when he was attacked at about midnight. He was found unconscious but died later in hospital from head, neck and facial injuries. He was beaten so severely his own family did not recognise him and he had to be identified by his fingerprints. In a statement, his family thanked the police, medical staff, victim support groups, witnesses, the judge and prosecution team and all those who had ensured "justice was served". "In a free and democratic society, Jody's murder was an outrage," they said. "Jody was not the first man to be killed, or terrorised, or beaten, or humiliated for being homosexual - or for being perceived to be homosexual. "Tragically, he will not be the last man to suffer the consequences of homophobia which is endemic in this society. "This is unacceptable. We cannot accept this. No intelligent, healthy or reasonable society could." Walker and Pickford showed Jody Dobrowski "no mercy"
Gay human rights campaigner Peter Tatchell said gay and lesbian people want to be able to live without the fear of homophobic abuse and attack. "Sadly that isn't always possible," he told the BBC News website. Both Walker and Pickford had been involved in an assault on another gay man in the area two weeks earlier, the court heard. Walker had been out on licence for assaulting and threatening to kill his own mother and had met Pickford at a charity-run hostel for ex-offenders. Walker's licence had expired the day before the murder, but he was still under licence at the time of the earlier assault. After sentencing, police released details of the attack. Walker and Pickford crossed Mr Dobrowski's path on their return after a night of drinking. "Following a brief exchange of words, Pickford threw punches at Mr Dobrowski," read the police statement. "Walker joined in the assault enthusiastically." One witness who tried to intervene was warned off and told by one of the pair: "We don't like poofters here and that's why we can kill him if we want". Officers arriving at the scene described Mr Dobrowski's face as "a bloody swollen pulp". Mr Dobrowski, who was originally from Stroud in Gloucestershire, was taken to St George's Hospital in Tooting, south London, where tests revealed he had a swollen brain, a broken nose and extensive bruising to his neck and spine as well as to his groin. He was so badly injured that a pathologist was unable to say how many times he had been hit but identified 33 areas of injury to his head, face, ears and neck.